Late September takes place over a 24 hour period and follows the course and aftermath of a birthday celebration arranged by a middle-aged woman for her husband, to whom she has been married for nearly 40 years. As the day and night progress, old rifts, new relationships and secrets emerge amongst friends, and the underlying tensions in the marriage can no longer be contained. Late September is the third feature from Jon Sanders, whose previous feature films were Painted Angels and Low Tide. To make Late September, Sanders had to find a new model of production and cinematic form. "We believe we have proved that it is possible to make a feature film of quality with a minimal budget and an exceptionally tight shooting schedule," he said. "We have used real time, long, fluid takes (sometimes up to 8 minutes), natural light and completely improvised dialogue. In Late September, there are only 32 set ups. To work like this, one has to be well prepared. The actors and key crew members are all very experienced and have the confidence to venture into uncertain territory. The structure is well thought out beforehand, but within that the actors, in character, determine the emotional and dramatic content of each scene as it happens. "All of us have found this way of filmmaking, 'without permission', to be challenging and liberating. It was the experience of making Low Tide that was the catalyst for the writing of the Belgrade Manifesto by myself and my colleague Nora Hoppe, which was signed, amongst others by Alexander Sokurov and Aki Kaurismäki, (www.belgrademanifesto.com)." The cast for the film includes Anna Mottram, Richard Vanstone, Charlotte Palmer, Bob Goody, Emma Garden and Jan Chappell. Composer Douglas Finch (who collaborated with Sanders on Painted Angels and several other projects) is Professor of Piano and Composition at Trinity College of Music, and a concert pianist with a particular reputation for classical improvisation. 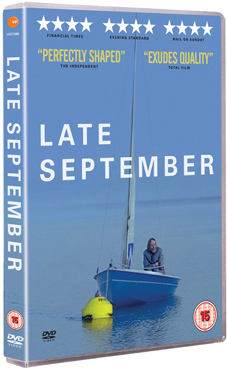 Late September will be released on UK DVD on 24th September 2012 by Drakes Avenue Pictures at the RRP of £15.99. Extras will include Actor in Search of a Charcter featurette.